Tens of thousands of ladybugs were released in Valley Ranch earlier this month to inspire people to try organic gardening. Visitors from as far away as Austin scooped up jarfuls of the 90,000 bugs during the 10th Annual Ladybug Release on June 1. About 150 people attended the event, which offers the ladybugs to people who want them to act as a natural pest control in their gardens. "They eat the harmful insects," said John Lee, owner of Gibson Garden Center. "Their main course of meal is aphids, but they eat mealybugs, mites, other insects in the garden," he said. Four-and-a-half-year-old Kendal Thiele has fond memories of the ladybugs she befriended. "One came in the house, and it slept on the pillow, on my Hello Kitty pillow, with me," she said. "Once we had them in a jar, we just kind of poured them out into the trees, the leaves, the plants, everywhere," resident Michele Tapia said. Chris Schappaugh, Valley Ranch Association community manager, said the event has grown every year. 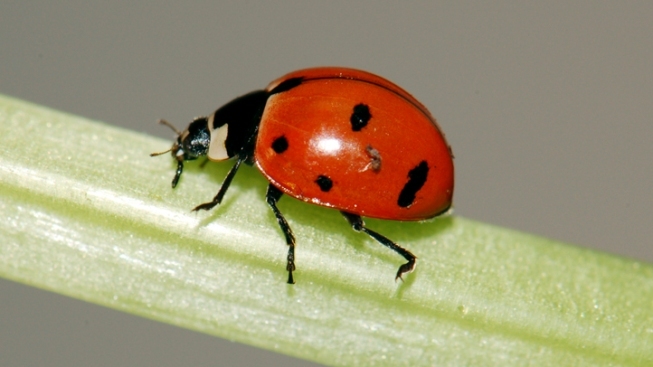 This year, the group increased its order from last year's 30,000 ladybugs. "When you bring a community together, people know each other, and that fosters communication, and that can go even farther, to things like safety, other opportunities," he said. The ladybugs were purchased at Gibson Garden Center, where sales have increased as organic gardening grows in popularity. The store used to sell less than 10 containers of ladybugs per week, but now sells about 50 per week, Lee said. Lee said he keeps the ladybugs in a minifridge so they can sleep until they're put to work. Their average life span is about eight weeks, he said. Tapia said her little friends can stay as long as they want at her yard. "We just recently started gardening, so hopefully we see the results of releasing the ladybugs," she said. The annual event takes place on the first weekend in June.